Whether you just need an extra bit of space to keep a side dish warm or you want to cook a separate course simultaneously, a double oven gives you the flexibility to multitask to the max. Depending on your kitchen layout, you will either install a built-in oven at eye-level or, in the same way as a traditional style cooker, beneath the hob. We have options to suit both styles of kitchen layout, look for built-in for ‘eye-level’ installation and built-under for models that go under the counter top. Don’t miss the DK1151 double tower oven, our biggest double oven model. It combines two fully sized single ovens on top of one another, each with completely multifunctional cooking, Which is ideal for when you need the same dexterity with cooking functions and at the same time need the space to fit in the same amount of food that you would in your main oven. It makes use of valuable space with its built-in, eye level design and is perfect for easily taking dishes out and putting them into the oven without bending down uncomfortably. 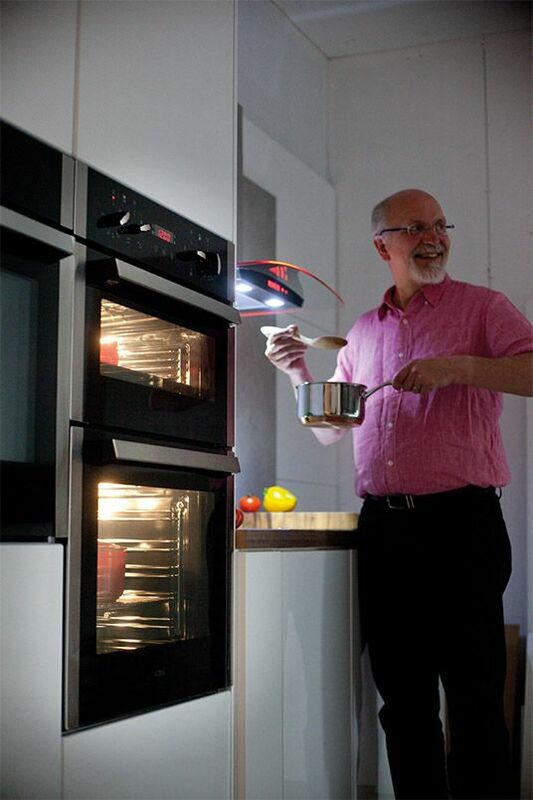 Our other built-in models feature a full size main oven with a slightly smaller conventional oven on top. They are still installed off the floor to give you that convenient access and there are two grills to choose from so that you can use the flexible cooking functions however you want to. These models are perfect for cooking an additional dish at a different temperature, keeping food and plates warm or even preparing an entirely separate course simultaneously. 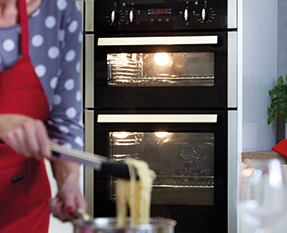 Take a look at our comprehensive oven function guide which goes through the individual cooking functions available in our oven range and discusses how they work as well as what dishes they perform best with. The built-under models are the same in that they feature a second, slightly smaller conventional oven but they are designed to be installed below work surface level. This could be ideal if your kitchen has predominantly low level units in its design, leaving the eye line clear of obstruction. There are various colour and style combinations to consider from our signature black glass and brushed steel design to all black, all white or the unique steel ‘Q’ design. Whatever look you go for, every model features the same double or triple glazing safety glass, ergonomically designed control knobs and extra safety features like anti-tilt shelving inside. All our double ovens come with excellent energy ratings to make sure that you are getting the best value for money at home and that they are efficient and kind to the environment. Even the internal halogen lighting inside our ovens is efficient and bright for practicality and saving energy. If you are not sure what oven you need to suit the requirements of your family, take a look at our oven buying guide to dispel myths and explain jargon so that you can make an informed decision with your next appliance purchase.